Welcome to the opening page of Francisco de Hollanda, author of the treatise Da pintura antigua, completed in 1548 and supplemented in 1549 by the shorter Do tirar polo natural, written after a lengthy sojourn in Italy. The purpose of this project, of which we offer the introduction here, is to address the task of making a first modern critical Italian translation of the treatise, and then to proceed with a critical commentary on the text, referring to the Art literature of the Cinquecento and exploring the topics that recur most frequently — colour, drawing, grace, invention — to show that Francisco de Hollanda assimilated the tenets of humanist culture, giving them his own original imprint and, in the matter of sacred images and their use, anticipating certain treatise writers of greater renown. The introduction is presented with a foreword© by Mauro Lucco, professor at the University of Bologna. The work is published by Silvana Editoriale, who have kindly given their permission for the use of the foreword. 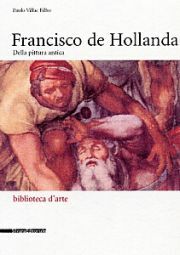 Francisco de Hollanda is considered, along with Vasari and Condivi, one of the “official biographers” of Michelangelo, an artist who in his own long lifetime worked carefully on presenting a certain image of himself, not least to those who would be its custodians and chroniclers. The outline he traced while alive was already taking shape perfectly when his obsequies were celebrated in Florence during 1564, with publication of the pamphlet “Eseqvie del Divino Michelagnolo Bvonarroti” by Giuntina. Francisco de Hollanda’s treatise is made up of three books. The first sets out to illustrate the universal nature of Greek and Roman art, as well as openly addressing the themes of sixteenth century artistic debate: the role of sacred images in education and in propagation of the Faith (Propaganda Fide), the demiurgic aspect of invention in the difficult and sometimes painful process of producing a work of art, the divine gift of grace, the affirmation of drawing as an artistic genre in its own right, and a tool enabling instant dialogue between thought, the source of the work of art — as proclaimed repeatedly by commentators and artists alike — and its materialization as a tangible entity after a rigorous “decanting” process, according to Platonic theory. The second book contains the dialogues, famous and argued over in equal measure, between the author and Michelangelo, whilst the third is dedicated entirely to portrait art. The treatise is not without sizeable passages of that brand of narrative tending toward egocentricity, promoted quite brazenly by Cellini in his autobiography (I, I): “All men of every sort who have done something of excellence, or truly resembling excellence, ought, if they are honest and worthy, to describe their own life by their own hand” — an incitement serving also, by the bye, to elicit a rash of prose that became persistent, excruciating and inexorable as the concept of “excellence” spread ever wider through the social sphere. Observing the tradition, the author explains in his long prologue what were the reasons that persuaded him to launch into such a bold undertaking. Filled with doctrine, having studied the classical authors and made an album of drawings accompanied by highly detailed notes during his time in Italy, he shows in the course of the treatise just how high was the consideration and honour accorded to painting by the ancient world, indicating concrete and exhaustive examples of Greek and Roman works from which we can still certainly benefit in some measure, if this euphemism is still pertinent today. From these, with the help of his album of drawings and by that projection of memory which cleanses all, he lists an impressive series of Renaissance works seen in the course of his travels in Italy: true records, in effect, are always documentary in nature. Even so, his ideas, unhappily for him, were being addressed to a court untutored and snobbish — sine nobilitate — in matters of Art, whose strength indeed was military and economic, not cultural, and the substance of his argument wore thin, based as it was on meetings with a very restricted circle of people, even in Italy where the influential embassies of his sovereign at the Papal court had enabled him to gain access to a privileged environment which he, as a good listener, proceeded to frequent, assimilate and distil into his treatise. Francisco de Hollanda did not realize that his artistic ideal of purity, like every other, fatally implies separation and not connection, also that the implementation of his unitarian aspiration to realize it and pursue it, the ultimate goal of every idealism (one might even say Utopia or revolution: strictly speaking, both stem from Christianity), would have required Herculean strengths. It is a wonderful paradox that thinkers formed in the classical mould should espouse a romantic ideology, whilst romantics lean toward the classical. A society changes when the perception of time changes. In all probability it was the need for a rationalization of myths that provided the impetus, and subsequently imposed the need on the various voluntary forms of human association, to establish anniversaries, to draw up and revise calendars: indeed the last such revision was ordered by Pope Gregory XIII in 1582, nineteen years after De Hollanda’s treatise was penned. Even if the notion of synchronicity may not yet have spread universally, all societies, from the neolithic to the so-called evolved, are similar in their sovereign desire to measure time. In the era of the art known to Francisco de Hollanda, the temporal factor was not cyclical as it had been for the Greeks, neither was it pragmatic as that of our own worldly ambition, or eschatological as that of our faith, but atemporal. Such a vision of the world could not easily be shared in Portugal, nor indeed anywhere else. Moreover, its abiding order exists in a mental continuum, a domain of the spirit, uninhabitable by humans; in effect, there is no room for love between men and women, for desire, and men cannot slake their thirst at its fountains, much less shelter or play with children within its architectures, as these are places of the mind. Conquest and possession. Interiority and estrangement: “triumph and despair” to use the stark expression of Hannah Arendt, would henceforward be Man’s travelling companions. The Brazilian poet Vicente de Carvalho reminds us, less bluntly, that Happiness is where we choose it to be; unfortunately we are never in that chosen place. Art is a product of humans. With them, like them, it passes through different phases. For now, our lot is to live in an age of neoformalism where the apparent forms have no depth. My thanks to M. Lucco of the University of Bologna for his frankness and kindness in showing me the benefits of separating the corn from the stubble. Thanks also to Bruna, “minha nega”, for relieving me of mundane tasks and duties while keeping peace in the home, for her philological help and for her love, fortified by the birth of our young son, a beacon of light in my life. This book is dedicated to the lasting memory of my parents. This site is a virtual place, by definition, and in contrast certainly to the predominating speculative spirit of the times, access to the content is free. Please respect the intellectual property rights of the author. Feel free to write if you have questions or comments; I will be glad to reply as and when commitments allow. Paulo Villac Filho was born in Brazil in 1959; he studied in the United States, then in Spain and Italy where he has taken graduate, post-graduate and doctorate degrees.